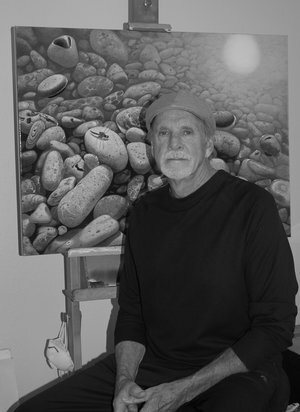 Gregory Simmons is a contemporary realist painter currently composing a series of close up landscapes of the central coast, intertwining still life of reflective and transparent objects from his studio in Atascadero, California. Travel has been fundamental to Greg’s development as an artist. Living in Hawaii for a short period at eighteen opened his eyes to adventure and life’s possibilities. Immersion in other cultures and observation of artists from Denmark, New Zealand and Australia, influenced his luminous detailed glazing technique with acrylics. With a background in commercial art, advertising and dental ceramics, has allowed Simmons to define his creative work with detail and precision. In the summer of 2001, Greg moved to the beautiful central coast of California to paint full time with complete dedication. He has participated in group and solo shows where his work are included in numerous private and public collections.